Not too long ago I started a series of Idiom paintings. Idioms are so much fun to illustrate, providing a golden opportunity to show what a phrase or play on words means to me. Just like in my other idiom painting "Holy Cow,"
the idiom "Fat Cat" brings ups up all kinds of ideas about what it really means to be a fat cat. 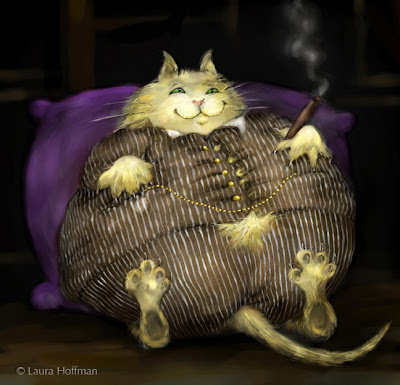 Fat Cat is a political term originally meant to describe a filthy-rich political donor who is able to buy access and influence, to fuel that rich person's personal gain. Fat Cats can live easy off the work of others. 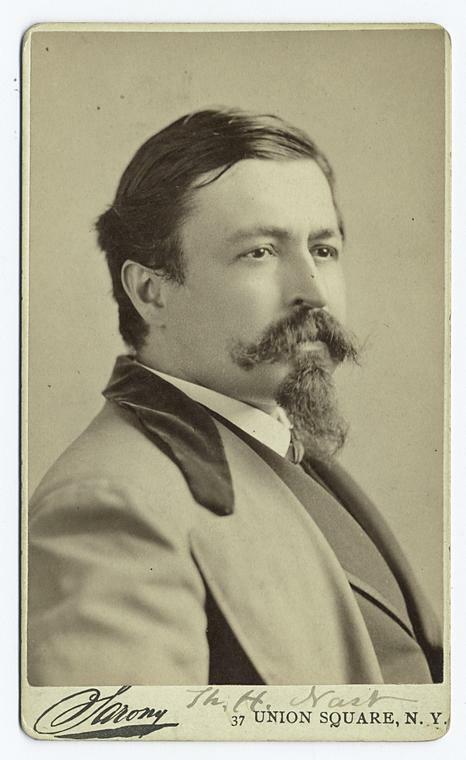 Thomas Nast (1840-1902), the American illustrator known for coming up with the look of Santa Claus, mocked Tammany Hall's notorious king of corruption, Boss Tweed - the quintessential fat cat of his day. Through years of fearless caricature, Nast's illustrations helped promote the downfall of one of New York City's most crooked and corrupt politicians. 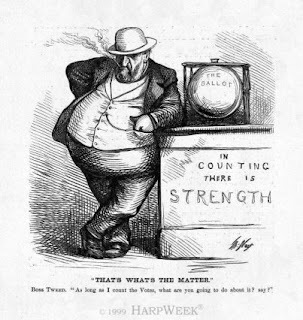 His merciless political cartoons helped identify and bring down fat cat Boss Tweed, who ended up dying in jail in 1878. It is estimated that Tweed and his cronies stole anywhere from $400 million to $2 billion dollars in today's terms during a two year period from 1870 to 1871. Legend has it that Boss Tweed offered Thomas Nast $1 million to "Stop them damn cartoons!" But Nast refused the bribe. 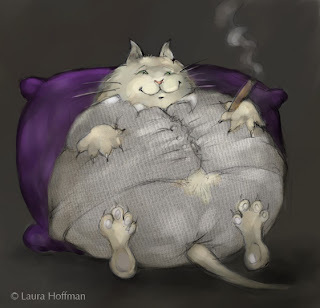 Fat Cat was first sketched, then painted using mixed media. The stripes are applied last, following the fat stuffy contours of the Fat Cat's body. Look closely, and you'll find his gold watch straining against his pin striped suit and the glow of his fat cigar. His fluffy hair is poofing out of his 3 piece suit in unfortunate places. Fat Cat, my painting, has made the rounds! It won entry and a certificate of merit in SI-LA (Society of Illustration of Los Angeles) Illustration West #48 competition and exhibition (March 2010). Fat Cat has hung proudly in a few exhibitions at CSUF (California State University Fullerton). 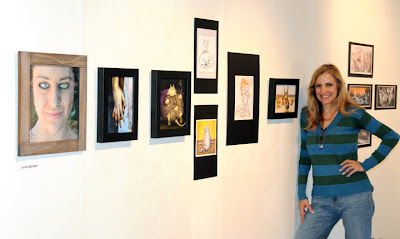 Here I am at the Evolving Narratives MFA Illustration show, curated by Barbara Malley. 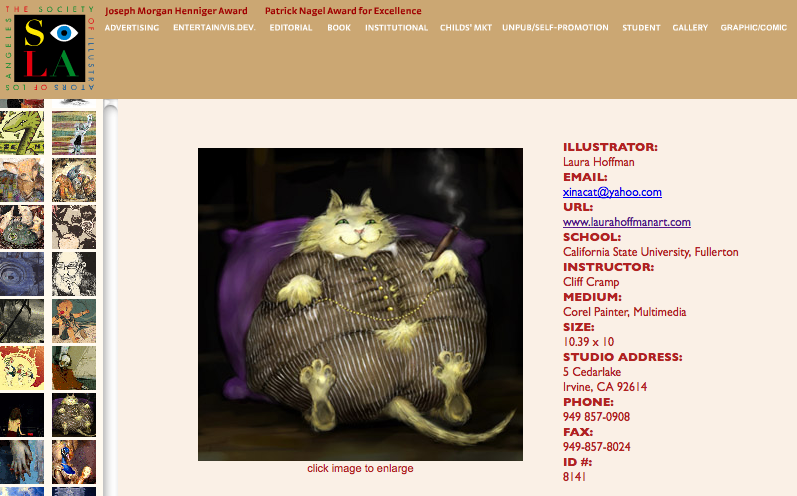 I donated Fat Cat to LCAD’s (Laguna College of Art & Design) annual Collector’s Choice fundraiser. 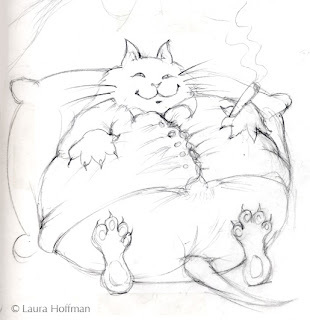 Another version of Fat Cat is hanging now at the Orange County Fair until August 12.